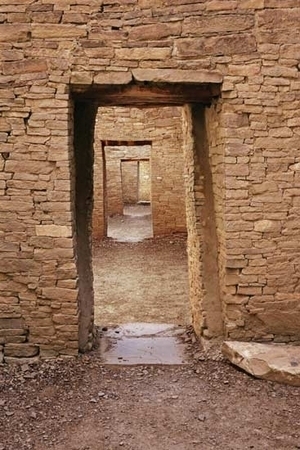 Located in northern New Mexico, Chaco Canyon houses some of the most magical sites of ancestral Pueblo people who built and occupied this "Great House" called Pueblo Bonito between AD 828 and 1126. As exquisite as the naked masonry is, the walls were probably covered with stucco and painted. What I find fascinating about this image, is that while each of these rooms are roofless and open to sunlight, each is bathed in a slightly different shade of sandstone - maybe due to slightly different amounts of light that are bouncing around and reflected in each room. While it's very easy to detect differences in light around sunsets and sunrises, I've always thought the sign of a truly sensitive photographer would be to be able to denote the changes in light between a 10 minute period in the mid-afternoon.